Tween Tuesday is a weekly meme hosted here at GreenBeanTeenQueen to highlight great reads for tweens. Add your Tween Tuesday link below! About the Book: It's 1935 and jobs aren't easy to find. So when Turtle's mom gets a housekeeping job that won't allow her to have kids in the house, she send Turtle to live in Key West with her Aunt, Uncle and cousins. Turtle doesn't know anything about living in Key West and finds a whole new world. She encounters scorpions, a group of boys known as the diaper gang, a crabby old lady, and a legend about buried treasure. Can Turtle find the treasure and find her way to easy street? Sarah Teenlibrarian Says: I'm a bit mixed on if I think this book was Newbery Honor worthy. On one hand I really enjoyed it, the storyline is great, and the author weaves together a lovely plot. On the other, I thought there was a lot that wasn't developed and the book wrapped up too quickly. The end of the book felt much different than the beginning. The setting of 1930's Key West is a unique one-I didn't know much about Key West during this time, so I learned a bit from this book. But while this is a historical novel, it could almost be set in any time period. Turtle's life might be a bit simpler, and there are lots of references to 30's comics and Shirley Temple, but the characters and adventure and dreaming for something bigger fit no matter what the time period. Although Turtle is the narrator and the story is told in first person, there were times I forgot she was narrating the story. At times it almost feels like her voice goes into a third person limited narration. This threw me off a bit and I had to remind myself Turtle was telling the story. I also had a problem with how fast the ending wrapped up. 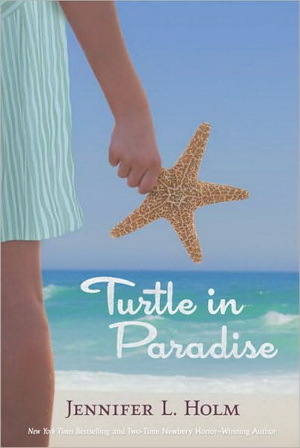 For the most part, the book reads almost like a diary, with day to day adventures of Turtle and her cousins in Key West. Then the ending throws in a bunch of twists and instead of giving time to wrap things up with these characters we've gotten to know and care about throughout the book just ends. As an adult, I got the subtlety that is thrown in at the end and could figure out the things left unsaid (and yes, it's a bit predictable) but I wonder how much will go over young readers heads. It might sound like I didn't enjoy this one, but I really did! It's a fast read that's full of humor and I really enjoyed Turtle's voice. She's a likeable character and she reminded me a bit of India Opal Buloni from Because of Winn-Dixie or Franny Chapman in Countdown. I loved the diaper gang and thought they were hilarious! And the setting of 1930's Key West makes the book stand out and a bit more unique. It's a great read and I flew through it-it's a very easy read. It would be good for a classroom read aloud and I think it has some kid appeal, especially for readers who like historical fiction. I could even see it being used as a step up from the American Girl series for readers who like Kit. I just would have liked a more fleshed out ending. This sounds like a very interesting book. Why do you think it got the Newbery Honor? The time period seems to make it more award-worthy. Do you think the unusual narration (first person that somehow feels very limited) made it seem more artsy? It's interesting to think about what makes a book appealing to the awards committee. I bought this for my library this fall but nothing about it made me want to read it very bad. I might have to add it to my summer list though. Alison-I think the historical aspect is good and historical books always seem to appeal to award committees. The narrator is a spunky girl who is easy to like and the characters are very well rounded and the setting really comes to life. I just wish it would have spent a little more time at the end-it all seemed so rushed. I felt the same way about this one. Great start and a wonderful historical feel, but the ending was really fast and blunt. Left me feeling like there was something missing.